Another great week in beautiful Minnesota! We've had a lot of success with the Christmas initiative this week! During our weekly service at a local food bank/church named Prince of Peace, we were able to show the #LightTheWorld video to the other volunteers and give pass along cards to some of the people we helped. If you guys haven't checked it out already, Mormon.org is updated with all the #LightTheWorld Christmas videos! Also, this week we were able to finally reconnect with an investigator named Antonio Rodriguez who basically fell off the grid for about a month. Apparently, he lost his phone so we couldn't get a hold of him which was frustrating. But, we were able to teach him a re-run lesson of the restoration of the Gospel of Jesus Christ. And another little miracle, he is an alcoholic but he told us he wants to quit and he hasn't been drinking for 10 days! We testified to him of the incredible blessings we receive by keeping the Word of Wisdom by not drinking and putting other harmful things in our bodies. On Saturday we drove up to a small city of about 10,000 people called Waseca. A while back they had a really bad rain storm and flooding that caused over 10 million dollars in uninsured damage. Many people had their basements and homes destroyed, but couldn't get the help they need to clean it up. The President recently announced it as a national disaster, which allowed them to get help from various natural disaster teams. 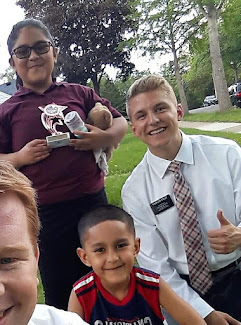 Missionaries in the area and surrounding areas as well as other members of the church were invited to make the trip over there and participate in the clean-up work. We met up with a group of about 150, including disaster clean-up crews and other volunteers from surrounding cities. We then broke off into smaller teams and were assigned specific homes to help clean up. Our assigned house was a small farm house owned by a sweet older lady named Viola. We were able to help her sort through and clean up her damaged basement and organize her garage. It was a great experience and she was so kind and grateful to us! Later that day, we also helped a family in our small Spanish congregation move their furniture to a new apartment. It was an amazing day of service and a great way to spread the spirit of Christmas! On Sunday, we had a wonderful fast and testimony meeting. During the week we didn't have very much success in finding any new investigators, so as a companionship we fasted to be able to find new investigators and help the zone meet our goal. During sacrament meeting, we were privileged to hear the many testimonies from our humble Spanish congregation. Their faith is so strong! I was also able to bear my testimony and witness of the restored gospel of Jesus Christ. Although my Spanish still needs a lot of work, it was such a wonderful experience sharing my testimony! I would also like to share with all of you my testimony. And don't worry I will translate afterward for all of you gringos out there;). Yo sé que Dios existe y nos ama. Él es el Padre de nuestros espíritus y él tiene un plan para nosotros. Cuando estamos orando, nuestro Padre Celestial siempre está escuchando. Yo sé porque había sentido el amor increíble de Dios por medio de oración. También, yo sé que Dios envió su Hijo Jesucristo para expiar por todos los pecados del mundo. Jesucristo nos conoce personalmente y tiene tanto amor por cada persona en la tierra. Yo testifico que por medio de vendiendo a Cristo, podemos llegar a ser limpios de nuestros pecados y sentir de su amor infinito. Yo sé que la iglesia de Jesucristo de los santos de los últimos días es verdadera y la misma iglesia que Jesucristo estableció en la tierra. Yo sé, sin duda, que José Smith fue un profeta verdadera, y él tradujo el libro de Mormon por el poder de Dios. Yo testifico que el libro de Mormon es verdadera, y que un hombre se acercaría más a Dios al seguir sus preceptos que los de cualquier otro libro. Cada vez cuando estoy leyendo el libro de Mormon, puedo sentir el Espíritu Santo confirma de su veracidad y tanto felicidad en mi vida. Yo sé que tenemos un profeta viviente, Thomas S. Monson, y Dios se ha llamado èl para guiarnos en estos últimos días. Yo digo estas cosas en el santo nombre de nuestro salvador Jesucristo, amén. I know that God exists and loves us. He is the Father of our spirits and he has a plan for us. When we are praying, our Heavenly Father is always listening. I know because I have felt the incredible love of God through prayer. Also, I know that God sent His Son Jesus Christ to atone for all the sins of the world. Jesus Christ knows us personally and has so much love for every person on earth. I testify that by coming to Christ, we can be cleansed from our sins and feel of our Savior’s infinite love. I know that the Church of Jesus Christ of Latter-day Saints is true, and is the same church that Christ established on the earth. I know, without a doubt, that Joseph Smith was a true prophet, and he translated the Book of Mormon by the power of God. I testify that the Book of Mormon is true, and that man will come closer to God by following its precepts than by any other book. Each time when I'm reading the Book of Mormon, I can feel the Holy Ghost confirming its truthfulness and feel so much happiness in my life. I know we have a living prophet, Thomas S. Monson, and God has called him to guide us in these last days. I say these things in the holy name of our Savior Jesus Christ, amen. After church, we had a "linger longer" and all ate Mexican pasole, which is this awesome chicken and corn soup stuff! So in the MMM, we have our missionary "family tree." To briefly explain, your trainer is your Dad, your first companion after training is your Mom, your trainer's trainer is your grandpa, and it goes on from there haha. So when we took the picture at linger longer, me and Elder Callans decided to take a classic father and son pic and its perfect😂. Later on Sunday night, we were pretty frustrated by our lack of new investigators this week. We decided to pray for a finding miracle, and it happened! We went apartment tracting, and we found two investigators, one right after the other, both from El Salvador! We were able to share with both of them the Christmas message and video and set return appointments for next week. It's been such a great experience so far this Christmas season to be able to testify of Jesus Christ and invite others to serve! ¡Espero que usted tengan una buena semana!